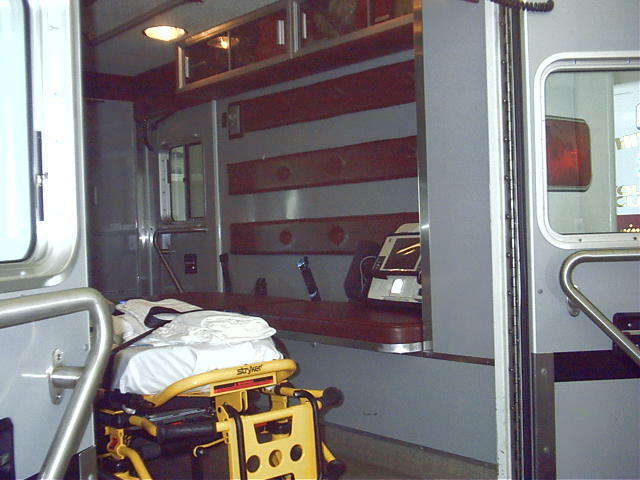 A view of the compartments on the passenger side of our ambulances. 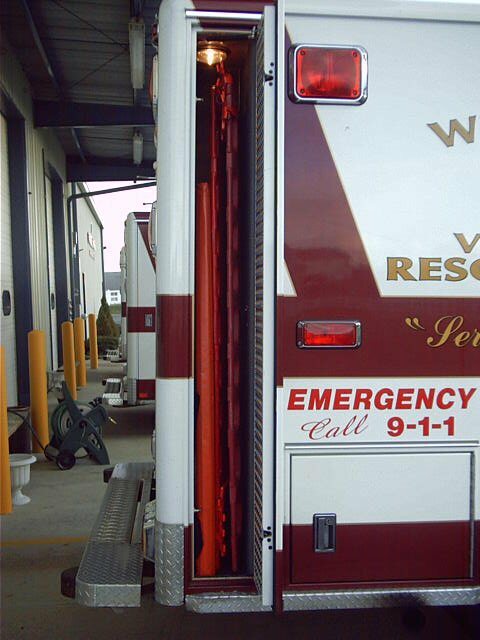 Both ambulances are arranged identically so that it is easier for everyone to remember where everything is. 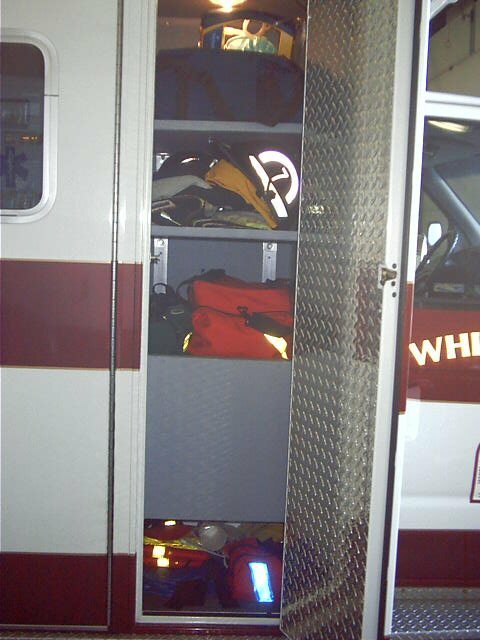 This compartment holds our main extrication devices, backboards, the Kendrick Extrication Device (KED), and Reeves stretcher. 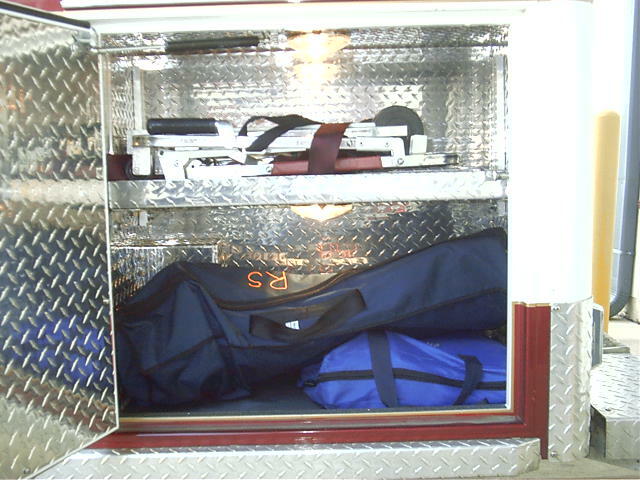 This compartment holds supplies that might be needed for injuries related to the spine. There are cervical collars, head blocks and spider straps for the backboards, and the ever-popular “Reeves sleeve” for those particularly interesting patients. 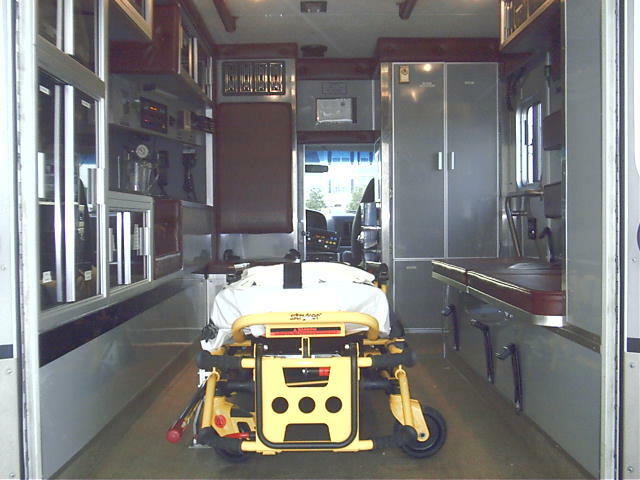 Another shot of the “spinal” compartment. 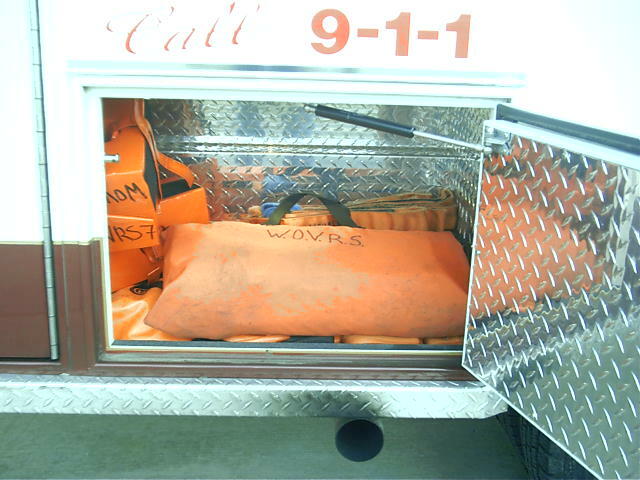 This is the “Jump” compartment which contains items that might be needed right away when we get to a scene. We have a “jump” bag that contains dressings, blood pressure cuff and stethescope, glucometer, pulse oximetry device, and other items to which we might need quick access. 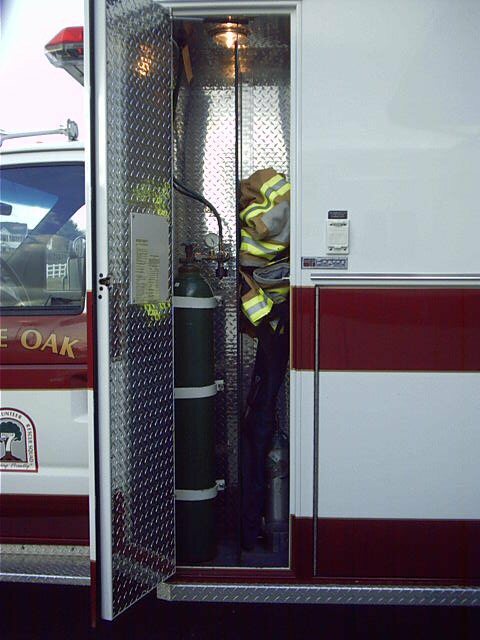 There is also an “O2″ or oxygen bag that contains a small oxygen container and masks that we use to help people breathe easier. We also carry a portable suction unit in case we need to remove liquids or other substances in order to keep a patient’s airway clear. 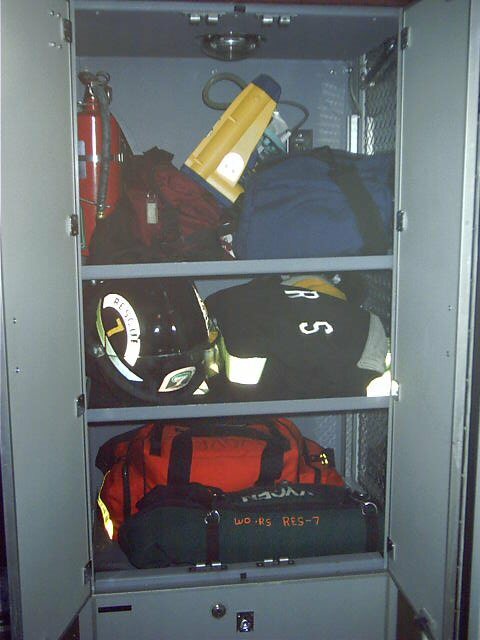 The attendant also keeps their helmet and protective coat in this compartment. Another view of the "jump" compartment, up close. 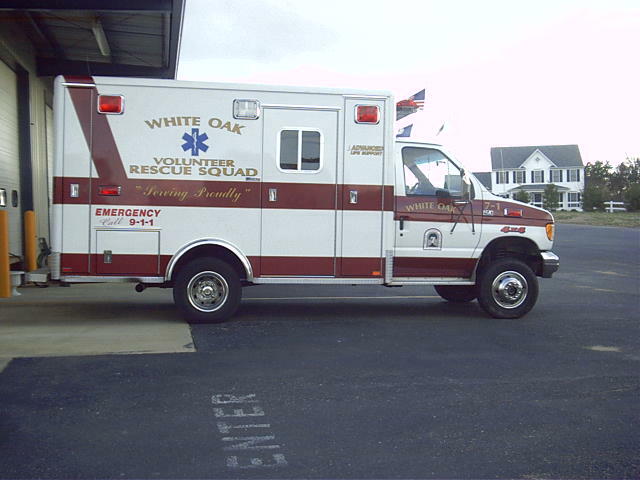 All of our ambulances are equipped with on-board oxygen with the ability to provide supplemental oxygen to several patients at the same time. 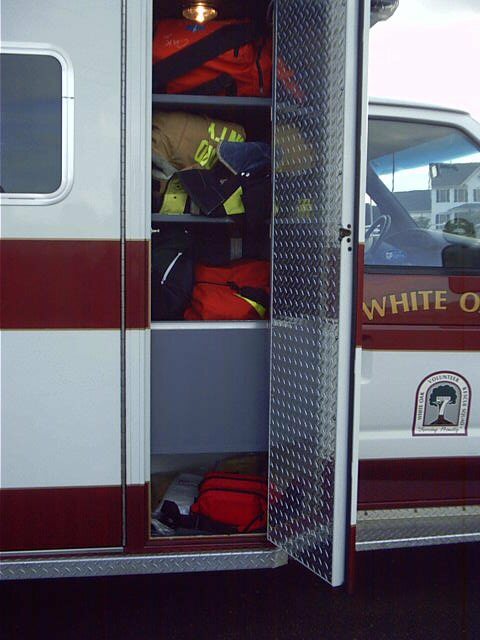 This compartment stows our main large oxygen tank, two small oxygen tanks, and the driver’s turnout gear. 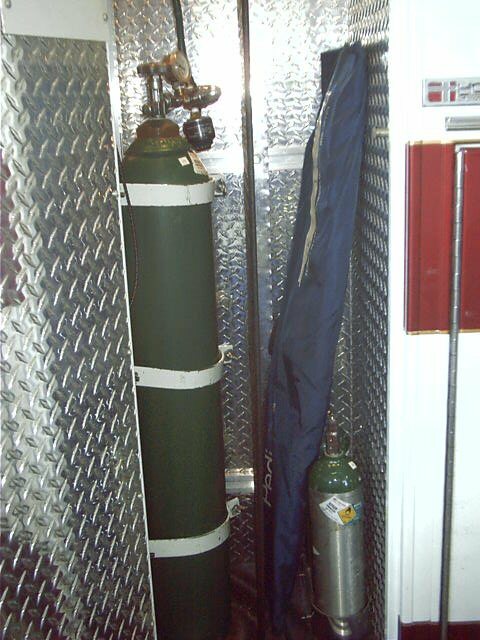 Another shot of the oxygen compartment. This compartment holds a piece of equipment called a “stair chair.” We use this equipment to move patients through narrow passageways or up and down stairs, hence the name Stair Chair. 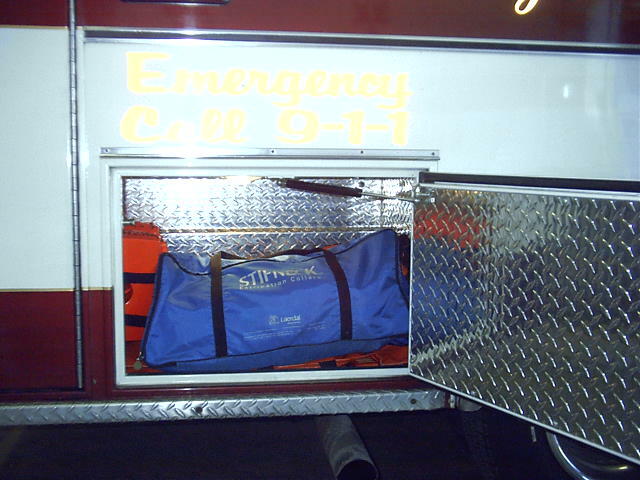 Also in this compartment are a traction splint for broken legs and an inflatable child car seat. 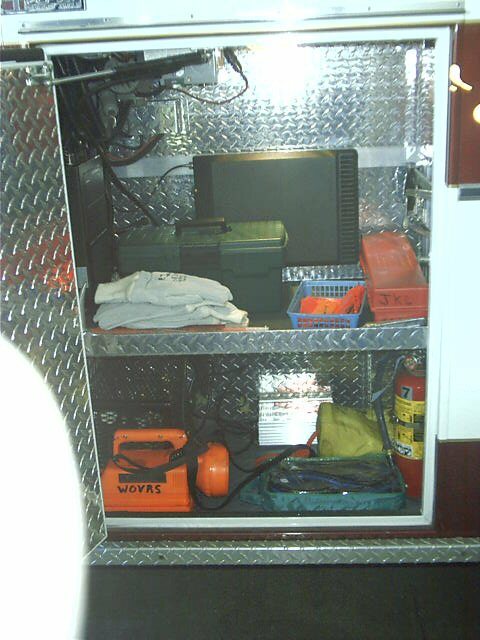 This compartment is our toolbox. 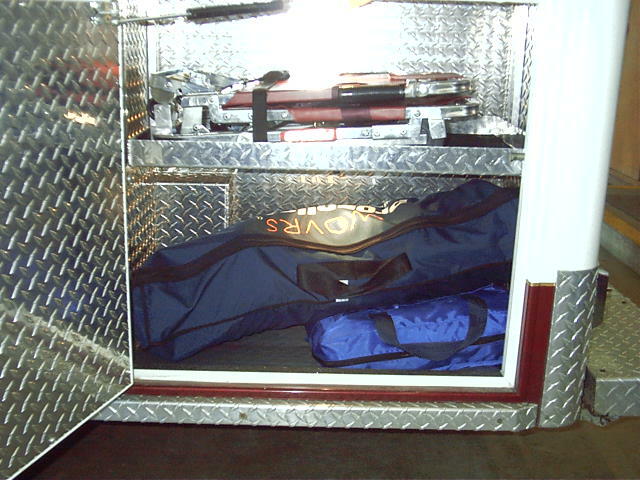 There are several pieces of equipment in here that we can use to help gain access to patients. There is a crowbar, a seatbelt cutter, heavy-duty/fire gloves, miscellaneous hand tools, a large flashlight, highway flares, and so on here. 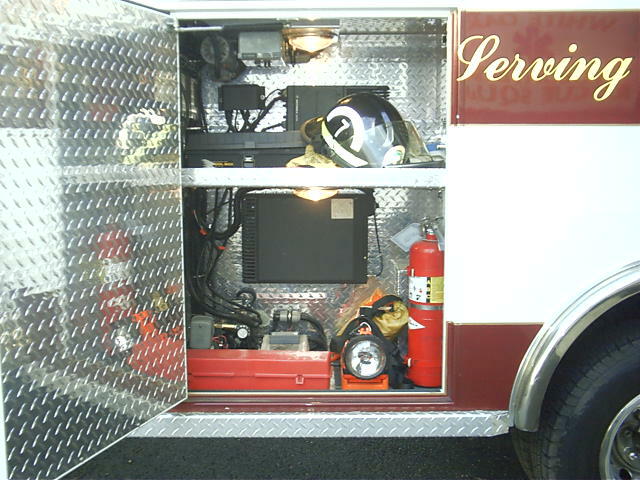 The driver usually stores his or her helmet in this compartment. 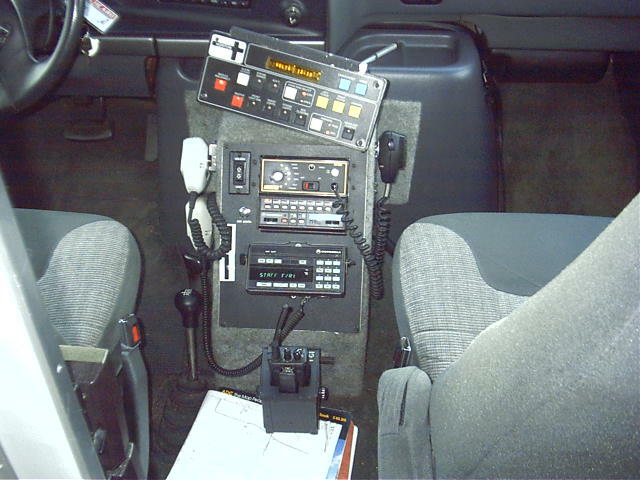 This is the main console in the driver compartment. There are switches for all the lights and siren and the microphones for our radios are here. This is the side entrance to the patient compartment. You see the attendant’s chair on the right. 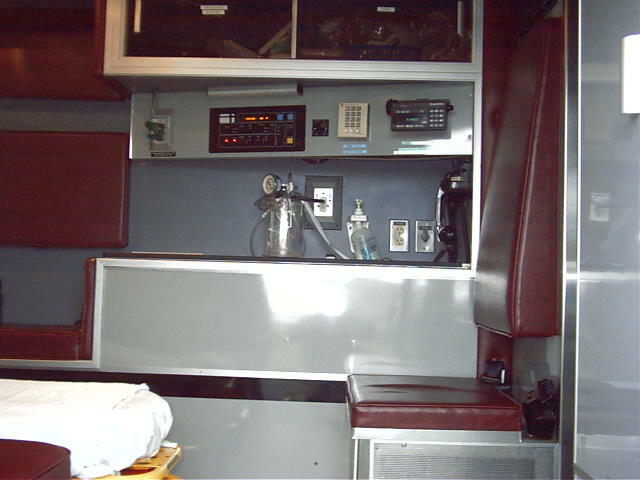 There is a console that the attendant uses to control lighting, temperature, oxygen, suction, and the radio. We are also equipped with an on-board cell phone. 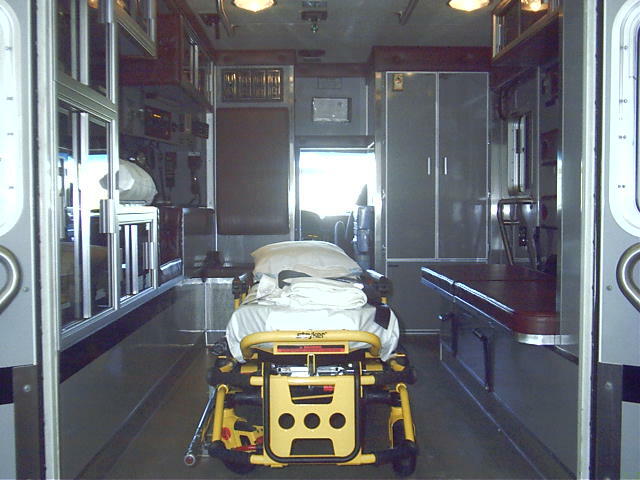 The attendant can use either the radio or the cell phone to contact the hospital or receive medical direction. 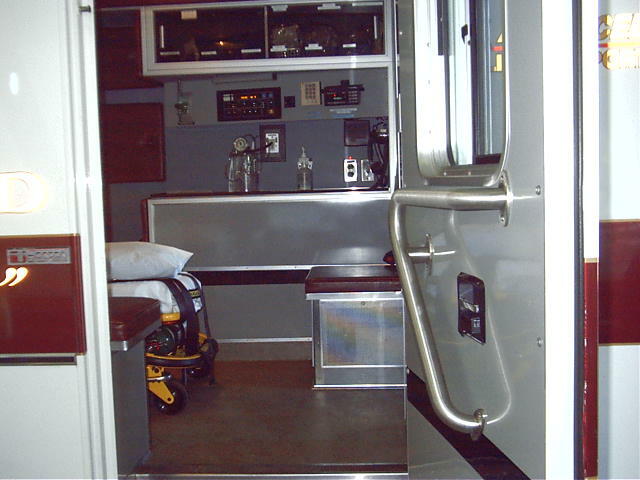 Here is a view of the patient compartment from the rear entrance. 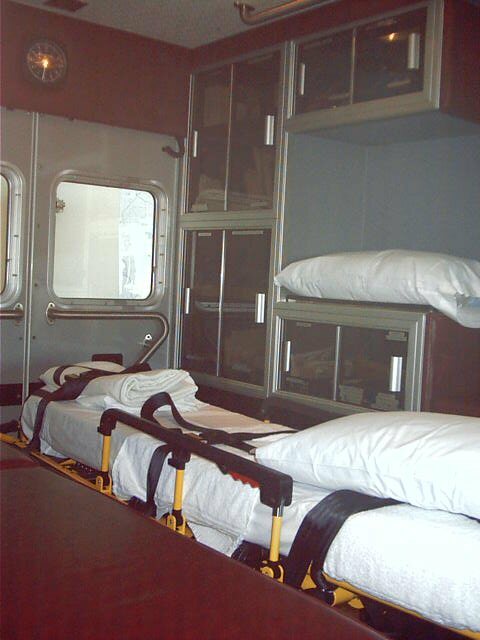 You can see that the cot, our main patient transport device, occupies a prominent position in the compartment. You can also see a second attendant’s chair on the left side of the compartment. 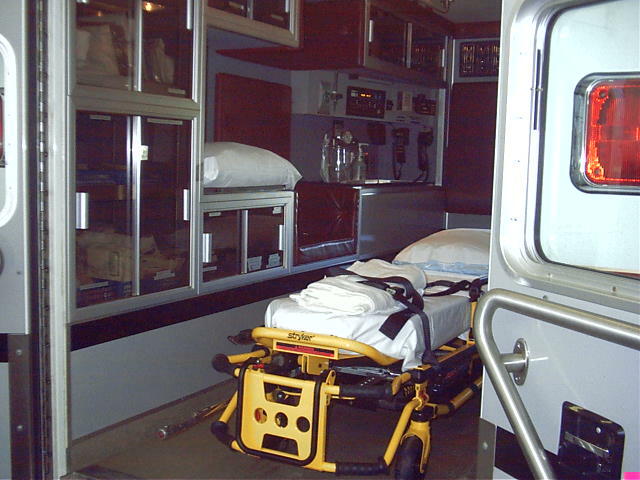 We can also use the bench on the right side of the compartment to hold patients. And more from the back. You can really see the side attendant’s chair on this picture. Notice also the cabinets which have all kinds of stuff that we might need to help sick or injured people. and even MORE from the back. Note the machine on the bench, this is our defibrillator.